Publisher: E.P. Dutton & Co, 1931. Revised edition. Condition: Former library book with library markings (see pictures). Otherwise a very good hardcover, clean text and firmly bound. 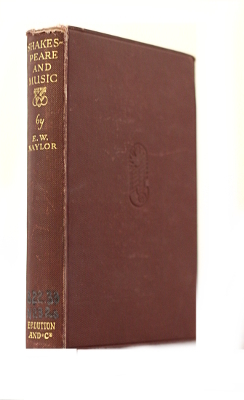 Contains 9 illustrated plates of musical instruments. A fascinating account of the music of Shakespeare’s time and how it was used during performances of Shakespeare’s plays. Includes the instruments used, keys and modes of music, some musical notation, and specific examples of the songs in various Shakespearean plays. Edward Woodall Naylor (February 9, 1867– May 7, 1934) was an English organist and composer. Naylor was born in Scarborough in 1867, his father, John Naylor was organist of York Minster. He gained a choral scholarship at Emmanuel College, Cambridge, where he gained a BA in 1887. From 1888 to 1892 he studied at the Royal College of Music. After spending eight years as organist of London churches St. Michael’s Church, Chester Square (1889) and St. Mary’s Church, Kilburn (1896), Naylor returned to Cambridge in 1898, where he became both the assistant master at The Leys School and organist of Emmanuel College. Naylor lived in Cambridge until his death in 1934. His most important compositions were for voices; his composition The Angelus, won the Ricordi prize for an English opera. His church music blends elements of 16th to 20th century music. Naylor was considered an authority on Shakespeare and music, and was an early exponent of greater musical authenticity. His son, Bernard James Naylor (1907–1986) was the first composer (1948) living in Canada to employ post-tonal writing in choral music, and was one of the pioneers of a truly contemporary (post-tonal) English (Anglican) cathedral music in the mid-twentieth century.